This Friday, June 20, will represent the seventh straight week of demonstrations in downtown Detroit in opposition to emergency management and the role of the banks and corporations in the ongoing dismantling and destruction of the city. 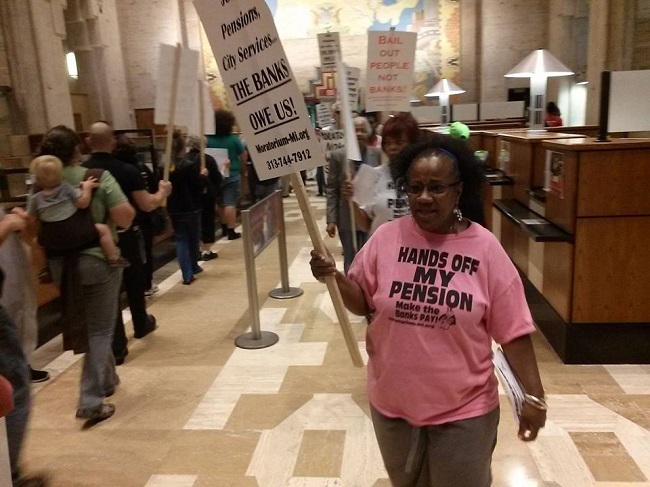 Demonstrators march inside the Bank of American branch in the Guardian Building during Freedom Friday 6, June 13, 2014. At 4:30 a march through downtown’s financial district will begin to protest the role of Chase Bank, Bank of America, the loan shark Dan Gilbert, EM Kevyn Orr, Gov. Rick Snyder, the illegal Land Bank Authority and other entities which are responsible for the wholesale dis-empowerment and exploitation of the people of the city and the region. We are calling for the total rejection of the bogus “Plan of Adjustment” and the immediate ejecting of the EM Orr. Pensions, healthcare, public assets, the DIA, DWSD, Detroit Public Schools and all other properties of the city must be protected from the corporate agents who have taken control of the state and local governments in Michigan. Pensioners, workers and all other so-called “creditors” should vote NO on the bankers’ plan of adjustment. Local control must be restored and the capitulationist program of the City Council and the carpetbagger mayor from Livonia should be resisted by the workers, seniors and youth of Detroit.